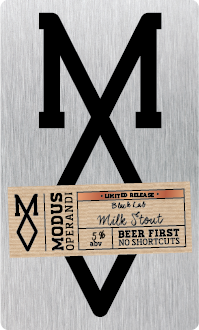 If you’ve ever popped up to the Modus Operandi brewery in Mona Vale, it’s likely that you’ll have been greeted enthusiastically by the brewery’s unofficial mascot, a silky, jet black labrador named Stout. Being a puppy, he’s eager to get into everything, including bags of fermenting fruit – destined for beer – that dogs really shouldn’t eat because it gets them drunk and worries their owners that they’re about to cark it. However, having survived the perils of brewery life to date, his big character and mischievous nature proved fitting inspiration for the brewery’s Winter 2015 seasonal release, a milk stout named Black Lab. It proved popular during its first outing so has become an annual midyear release in cans. As far as the flavour goes, Black Lab is built around bitter chocolate malt characters with a side serving of coffee and a rich roast. It's not as sweet as a lot of modern milk stouts but the lactose still gives it a smooth finish amongst all those heavy dark characters, seemingly even more so as you let the chill wear off just a little – a worthwhile wait if you want to let this be a proper Winter warmer.